Learn and practice the note names of the lines and spaces of the treble clef. This game does not include ledger lines. 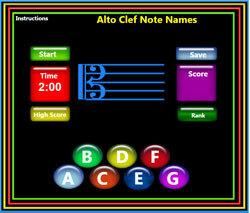 Learn and practice the note names of the lines and spaces of the alto clef. This game does not include ledger lines. Learn and practice the note names of the lines and spaces of the bass clef. This game does not include ledger lines. Learn and memorize Major and Minor Key Signatures. Learn the note names of the lines and spaces of the treble clef, including ledgerlines. Practice the note names of the lines and spaces of the Bass clef, including ledgerlines. Orphanage One is designed for young musicians to learn the basic elements and symbols of music notation starting with basic note values. Whole, Half, Quarter, Eighth and Sixteenth notes are drilled in this game. 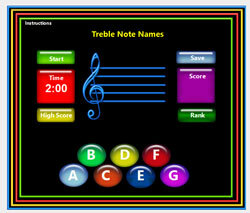 Learn and practice note names of the treble clef with an interactive piano keyboard. No ledger lines with this game. Learn and practice note names of the Bass clef with an interactive piano keyboard. No ledger lines with this game. 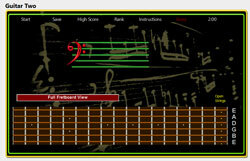 Learn and drill the E natural minor scale on the first three strings (E, A & D strings) of the guitar using an interactive guitar fretboard. E, F# and G on the E string; A, B and C on the A String and D and E on the D String. Save your score and keep track of your progress. Learn and practice the note names of the first three strings of postion one for the guitar by interacting with a the guitar fretboard. 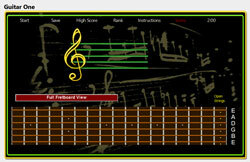 This game uses the first 5 frets of the G, B and High E strings. Testing the notes G, A, B, C, D, E, F, G and A. The Elements of Music is a series of short lessons explaining the basics of music notation. The quizzes will be scored and available to teachers via the Teacher's Mark Book feature. 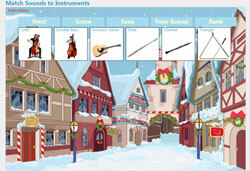 Students must be registered and logged in to access the Elements of Music lessons. After completing a lesson, students can test their knowledge of the lesson with a related quiz in the tests and quizes pages. Scores from the quiz will show up in the Teacher's Mark book if the teacher has created a class and assigned students to the class. 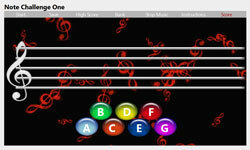 Various tests and quizes realted to the Elements of Music pages and Games. You must be logged in to play. Teachers, all your students saved test and quiz scores will be available in the Teacher's Marks Book feature. Learn the basic interval ear training. Perfect 4ths 5th 8va Major 2nd, 3rds 6th and 7th's. Starting from same note in an upward direction. Learn the basic interval ear training. Perfect 4ths 5th 8va Major and Minor 2nd, 3rds, 6th and 7th's and Augmented 4th. Starting from the same note in an upward direction. 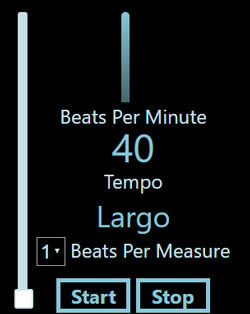 The metronome is the most valuable tool music students have. It is also underused. Here is a simple one for free! Note values change depending on the time signature. A quarter note can receive more or less than one count depending on the time signature. 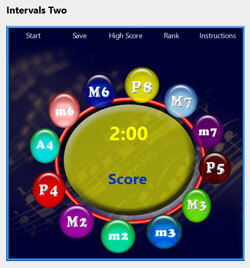 This game will help students learn that the top number of a time signature denotes the number of beats per measure and the bottom number of the time signature lets you know what kind of note ( whole, half, quarter, eighth) gets one count. Correct the Rhythm teaches note value with in the context of various time signatures. Learn the basics of counting music, whole notes, half notes, quarter notes, time signatures. Click Start button to play. A note will appear on the staff. You have two minutes to name as many note as you can by clicking the button with the name that matches the line or space the note is on. 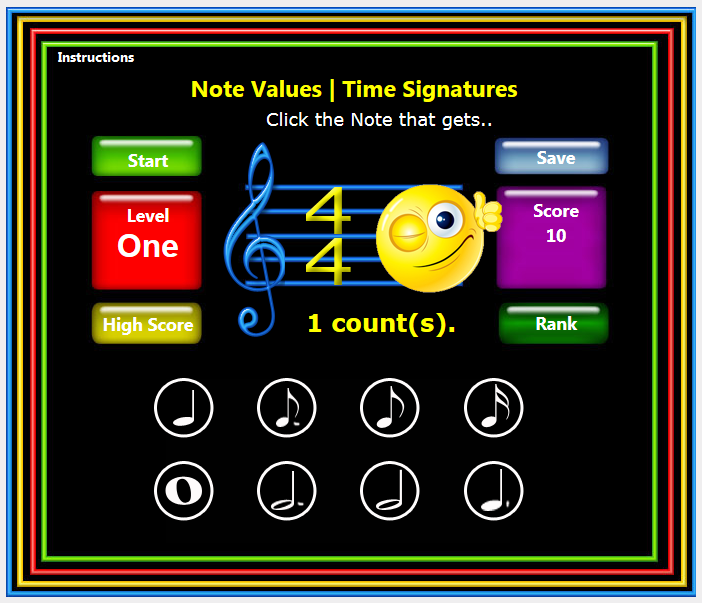 The faster you name the note the higher the score, be careful however, if you get the name wrong It subtracts from your score. If you wait to long to name the note the game gives you a new note to name. You must be logged in to save your score. When you do It saves the number correct, wrong and percentage As well as your game score. To receive a ranking & save your scores you must be logged in. Click Continue to play without saving scores or ranking. This new feature allows teachers to create classes and add students to each class by entering the students user name with the class. You can then view all the top scores of all the games played by individual student in the class as well as all the students scores in the class of a particular game. This will make it easy for teachers to track student progress. Students must be registered and have been verified by responding to the registration confirmation email sent when registering. All user names and emails must be unique. I have tried to make this as anonymous as possible by only gathering emails and user names from the users. Selecting a class shows all the students (User Names) attached to class. You can then select an individual student and view all the top scores of all the games the student has played. 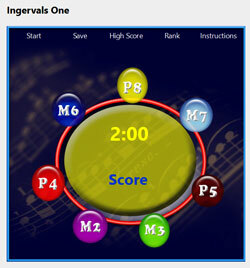 Selecting a game from the game list will then display the scores for each student in class. 1. Teachers and students must be registered and verified by responding to the confirmation email sent to you when registering. Check your "Junk Mail" if you did not recieve the confirmation email. 3. On the Profile page check the Yes I am a Teacher check box. - this will add the Teacher's Mark Book link button to your profile page. 4. Go back to the Profile page and click the Teacher's Mark Book button that has now appeared. 5. Create a Class - click the Add Class button and enter a unique class name and then submit new class. Then click the close button which refreshes the page. 6. Adding Students to a Class. - First select the class name from the list then click the Add Students to Class button. You can add multiple user names each followed by a semi-colon. ( eg. john;mary;yourUsername). User name must be unique so ask your students for their user name that they registered with. Then click the submit button. You may also remove a student from the class by selecting a student the clicking the remove student from class button. If the submit action fails double check your user names to make sure they are registered and spelled correctly. 7. Once the class user name have been entered you will have quick access to your students game scores sorted by student or by game.